Spirited Away is without a doubt one of the best animated features ever created, and arguably one of the most magical tales in the world of cinema to ever have been birthed. And its creator is none other than Studio Ghibli’s mastermind, Hayao Miyazaki. Created for and inspired by five young girls who were friends of his family, Miyazaki sought to make a film that would portray a young heroine that they could look up to, and tell an amazing story whilst doing so. Miyazaki’s efforts are evident, as the film is deemed by many his magnum opus, and for good reason. Ten-year-old Chihiro Ogino and her family are moving to a new town, leaving behind all of their friends and family. This of course upsets Chihiro, who quickly establishes herself as whiny, cautious, and frightful. When her family stops to explore a seemingly desolate amusement park, Chihiro is horrified to find that it is anything but, and soon thereafter her parents are turned into pigs, leaving her stuck working at a bathhouse catering to demons, spirits, and other apparitions. However, she manages to endure with a select few memorable allies, including the ominous, yet familiar Haku. The bathhouse is one of my favorite settings portrayed in film. Every single creature that inhabits it, from the anthropomorphic beasts, elemental spirits, gods, and witches are wonderfully designed, all with intricate appearances and entertaining personalities. The vibrant colors, top-notch artwork, and excellent animation truly make this a surreal world distinct from the mortal realm, and easily engrossing you with it's imagination. It is complemented by some of, in my opinion, Joe Hisaishi’s best work. His score is so powerfully moving, propelling every scene in which it is featured, and ingraining itself in your mind and heart. All of this is tied together at the core of the movie, which is at its heart a coming-of-age tale for Chihiro. Initially insecure, timid, and shrill, Chihiro slowly develops throughout the film, growing in maturity and influencing those around her as she does so. Her growth is believable and heartwarming, because as she takes on more responsibility, and the movie’s secrets unravel, it’s themes of love, personal accountability, and growing up become more evident. 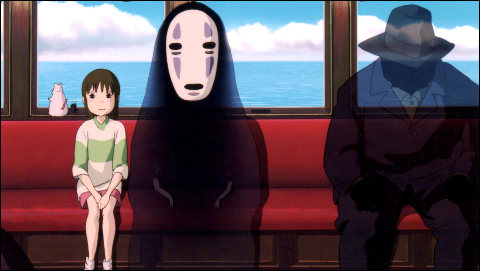 It is near impossible to not fall in love with Spirited Away. Every character is memorable, every scene recalled with fondness, and every frame wondrous to behold. Miyazaki’s movie is nothing short of a masterpiece, and a must-see for not only fans of animation, nor fans of film, but for fans of life and love.